Prev Baby Bathtubs: The Yay to the Nay Next How Often Do Kids Need a Bath? So I read your posts about happy spitters. And I have one. Oh boy do I have one. He’s 2 months old now and we’re on about 5 costume changes a day. And that’s with me being kind of negligent about amounts of barf on shirts (s’fine, right?). I would love love love to use my baby carrier instead of having to haul my stupid stroller up my apartment steps every time I want to get more milk but HE BARFS ON THE INSIDE OF MY SHIRT!!! Every. Single. Time. Someone gave me a Boba wrap at my baby shower and I’m hesitant to buy anything else until I get this barf thing figured out. But seriously? Let’s picture me struggling out of a Boba wrap with barf all over me and him and it. Yeah, fun times. What did you do? Did you try and carry your happy spitter (I’d look up which one of your guys it was but I’m hella tired right now) or did you just not bother? Or did you have some magic solution? Greetings, fellow barf-crusted mama! For the record, your hair smells fine. It’s totally not noticeable. Much. Yes, I DID carry my happy spitter in a variety of carriers — I experimented with some specifically because I was hoping maybe the barf would stop if I found some magical position for him. Lying down! Fetal! Upright! On my chest, on my back! On a train, in the rain! Yeah, whatever. Ike would casually yak all over me no matter what position I had him in. 3) Machine-washable carriers only, with an extra one in the car. With your extra shirts. 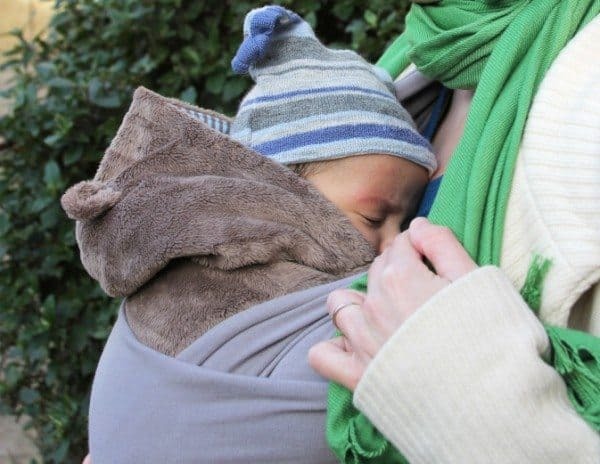 If you like your Boba Wrap, I’d suggest investing in a second one, or perhaps some other (MACHINE WASHABLE) baby carrier to have as a back-up. Keep it in the car, along with an extra shirt for yourself. (My pediatrician — who also had a happy spitter — told me she used to wake up and immediately put on at least two or three shirts right from the start. Then she’d strip them off as needed.) I used to keep a bottle of Febreze around as well to use on any burp cloths or clothing that got soiled while we were out, just to keep the car and my diaper bag from smelling like sour milk all the time. A wetbag is a good call too, even if you aren’t cloth diapering, just to seal up the grossness. If you use a baby carrier with any kind of shoulder strap, buy some removable “sucking pads” for it. Your baby probably won’t use them for a few more months, but they are SUPER great at protecting the straps from those times your baby turns his head to the side and yaks. Finally, at home, start trying to time the barfing and see if there’s any sort of pattern. Use the stopwatch function on your phone, if it has one. Feed the baby and set it. Ike would yak a little with his burps, but the “worst” of it usually came about 10-15 minutes later. Right when I started to put my guard (and my extra burp cloth) down. Try to NOT be wearing your baby during this critical digestive period. Otherwise (I would nurse while babywearing a lot, so it was hard to avoid), try to make sure you’ve got burp cloths ready and IN PLACE over your chest. And remember, you just had a baby. They barf. On you. We’ve all been there, out in public with vomit in our cleavage or white milky streaks running down the back of our shirts. We’re not judging. And if anyone does judge, just hand them your freshly-fed baby after a vigorous tummy tickle. WHOMP WHOMP. If you’re in the city or otherwise not using a car, it’s going to mean carrying more stuff (extra clothes, extra baby carrier, wet bag) without the benefit of the stroller to stash things in, which may make babywearing more trouble than it’s worth — for now. He will grow out of it though, promise! Try a woven wrap in stead of stretchy. My kid weighs almost 10 kg now and I still carry him on my belly. They make carrying lighter. I used all sorts of carriers for my happy spitter. Stroller barfing was gross plus I had a snap and go, so the barf would get on the carseat. Did the same as everyone else – took cloth diapers (I used real ones though, I think the Gerber ones are terrible, thick in the middle and thin on the outside? Just make them uniform thickness!) and place them across the top of my bust. Remove and replace as needed. Eventually she grew out of it. This too shall pass. Mine has been that way since birth and is still going strong at 4+ months! I found that the burp cloths and diapers got to be too small. She’s a genius at turning her head AWAY from the burp cloth and finding an unprotected surface to barf on! Now we’re using regular hand towels – they’re big enough to cover any possible surface 180 degrees around her head, we have lots and they’re easy to wash. Now whenever we take her out in the carrier, she gets to wear a towel around her neck like a scarf. Works great!! My youngest did was a spitter but not really, he just didn’t seem to know when to stop eating. so it would just trickle back out his mouth. We used towels. Full sized, not really good for after showers anymore towels. I would throw it over my shoulder and the across the front of my body while he laid on my chest. So when I emailed this question in, I thought ‘No way she responds to this one, no one else has this problem!’ Yes, it’s very comforting to know I’m not the only ‘barf crusted mama’ out there! P.S. last night he barfed through 3 tshirts on dad, yay! Also, we’re at our inlaws and I’m pretty sure Gram is rather overwhelmed by the amount of laundry he’s producing! Haaaa….she’s amazingly gracious about it thank god.